Western blot analysis of extracts from PC12 and NIH/3T3 cells, treated with λ phosphatase, 20% FBS (20 min) or 100 ng/ml PDGF (20 min) as indicated, using Phospho-S6 Ribosomal Protein (Ser235/236) (D57.2.2E) XP® Rabbit mAb (upper) or S6 Ribosomal Protein (5G10) Rabbit mAb #2217 (lower). 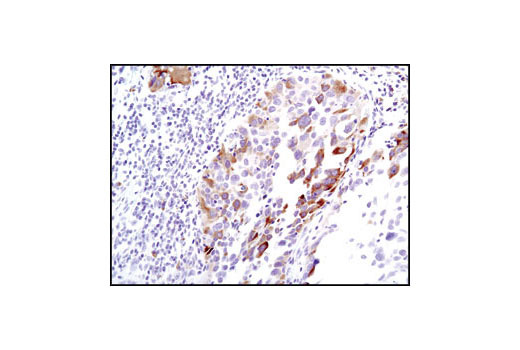 Immunohistochemical analysis using Phospho-S6 Ribosomal Protein (S235/236) (D57.2.2E) XP® Rabbit mAb on SignalSlide® Phospho-Akt (Ser473) IHC Controls #8101 (paraffin-embedded LNCaP cells, untreated (left) or LY294002-treated (right). 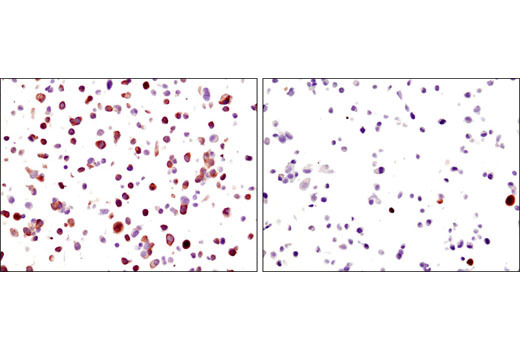 Immunohistochemical analysis of paraffin-embedded human breast carcinoma using Phospho-S6 Ribosomal Protein (Ser235/236) (D57.2.2E) XP® Rabbit mAb in the presence of control peptide (left) or Phospho-S6 Ribosomal Protein (Ser235/236) Blocking Peptide #1220 (right). 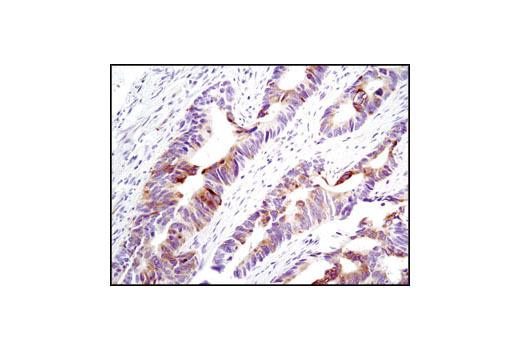 Immunohistochemical analysis of paraffin-embedded human colon carcinoma using Phospho-S6 Ribosomal Protein (Ser235/236) (D57.2.2E) XP® Rabbit mAb. 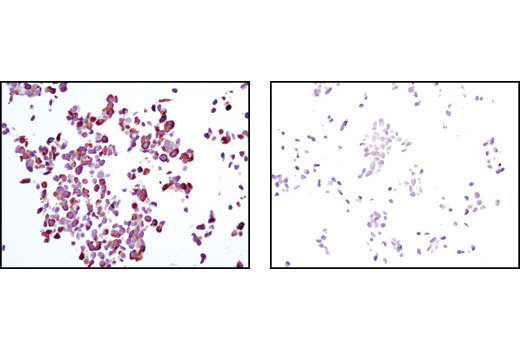 Immunohistochemical analysis of paraffin-embedded LNCaP cells, untreated (left) or rapamycin-treated (right), using Phospho-S6 Ribosomal Protein (Ser235/236) (D57.2.2E) XP® Rabbit mAb. 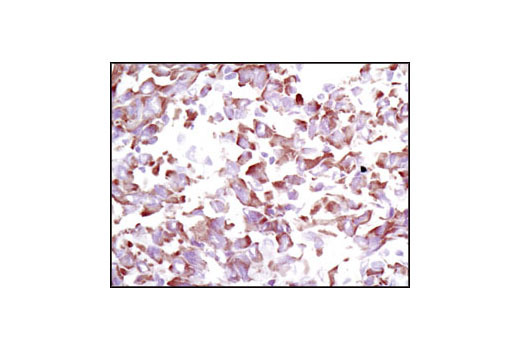 Immunohistochemical analysis of paraffin-embedded human lung carcinoma using Phospho-S6 Ribosomal Protein (Ser235/236) (D57.2.2E) XP® Rabbit mAb. 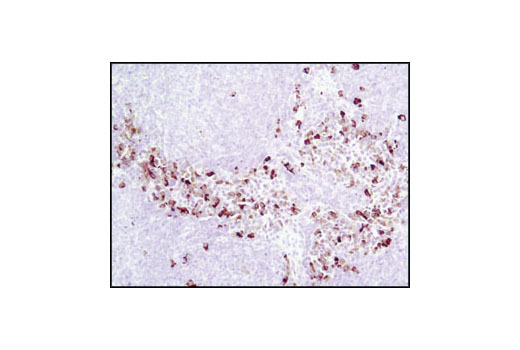 Immunohistochemical analysis of paraffin-embedded mouse spleen using Phospho-S6 Ribosomal Protein (Ser235/236) (D57.2.2E) XP® Rabbit mAb. 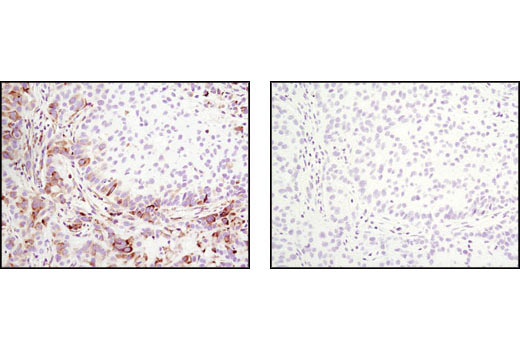 Immunohistochemical analysis of paraffin-embedded A549 xenograft, untreated (left) or λ phosphatase-treated (right), using Phospho-S6 Ribosomal Protein (Ser235/236) (D57.2.2E) XP® Rabbit mAb. 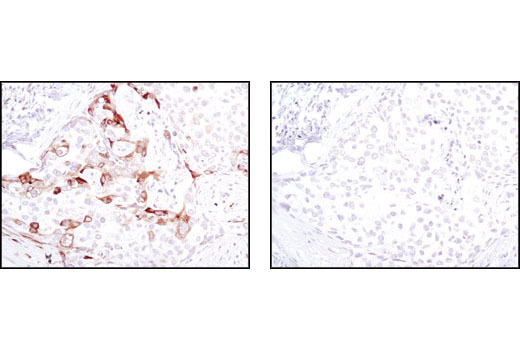 Immunohistochemical analysis of frozen U-87MG xenograft using Phospho-S6 Ribosomal Protein (Ser235/236) (D57.2.2E) XP® Rabbit mAb. 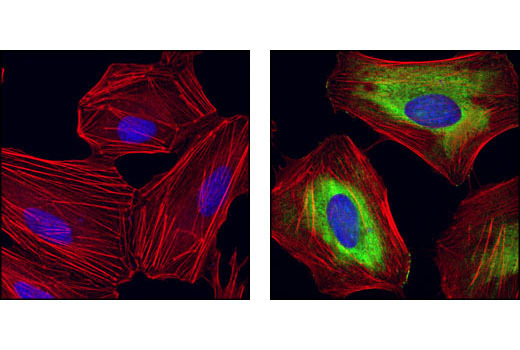 Confocal immunofluorescent analysis of HeLa cells, rapamycin-treated (left) or 20% serum-treated (right), using Phospho-S6 Ribosomal protein (Ser235/Ser236) (D57.2.2E) XP® Rabbit mAb (green). Actin filaments have been labeled with Alexa Fluor® 555 phalloidin (red). Blue pseudocolor = DRAQ5® #4084 (fluorescent DNA dye). Flow cytometric analysis of Jurkat cells, untreated (green) or treated with LY294002, wortmannin and U0126 (blue), using Phospho-S6 Ribosomal Protein (Ser235/236) (D57.2.2E) XP® Rabbit mAb compared to a nonspecific negative control antibody (red). Fixative: 10% neutral buffered formalin. Fix sections in 10% NBF for 10 min at room temperature. Proceed with staining procedure immediately (Section D). 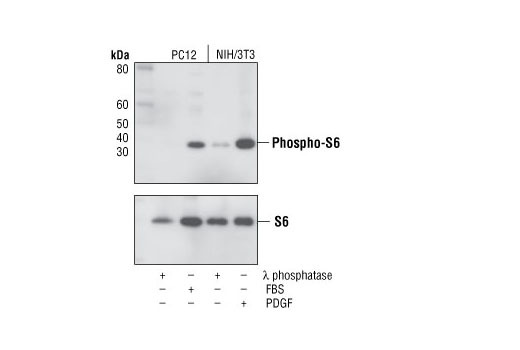 Phospho-S6 Ribosomal Protein (Ser235/236) (D57.2.2E) XP® Rabbit mAb detects endogenous levels of ribosomal protein S6 only when phosphorylated at Ser235 and 236.